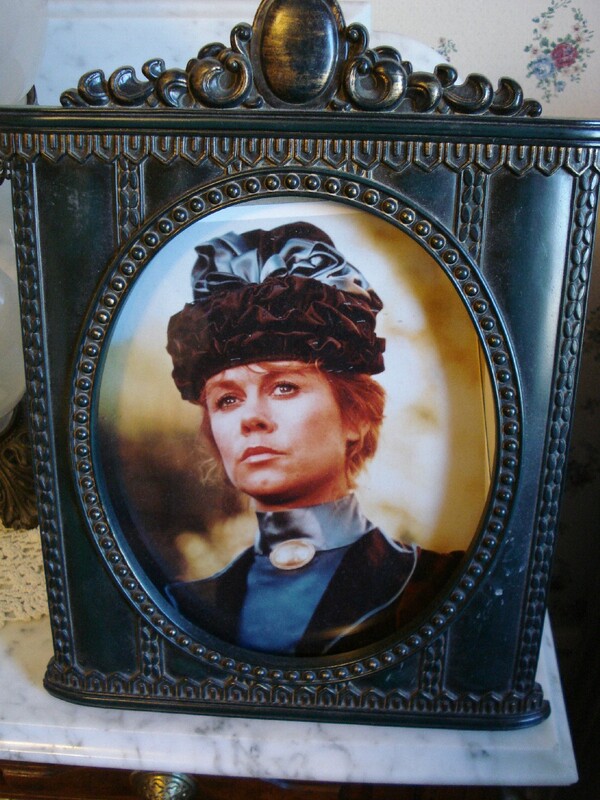 Set design and costuming as well as casting, can make or break a film. For those have seen the 1975 Legend of Lizzie Borden starring Bewitched’s beautiful Elizabeth Montgomery, getting the house and costumes just right were very important. The famous house had been photographed and blueprints of the layout have been well- known since the murders in 1892. Lizzie herself is frozen in time in those leg o’ mutton sleeves. 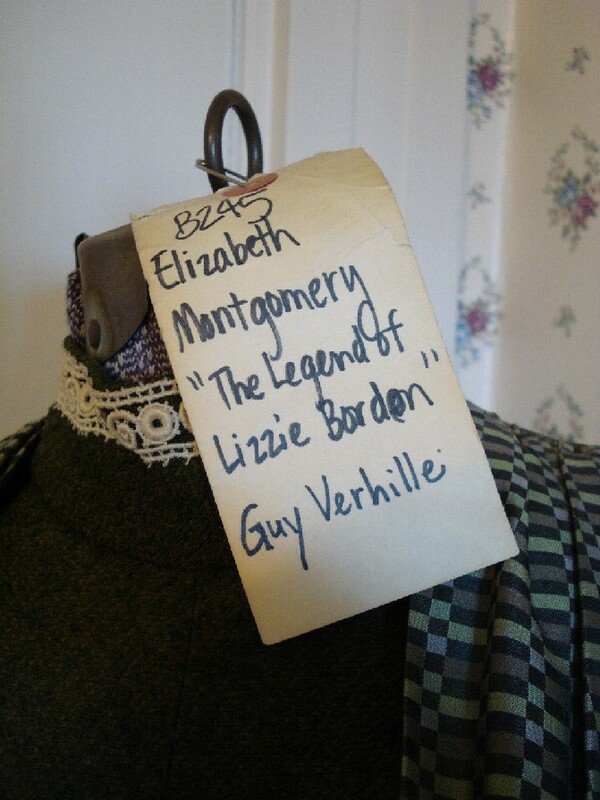 The house owners received Lizzie’s famous acquittal dress from Paramount Film Studio, and it is currently on display in the room where Abby Borden met her violent end. It is a popular item for visitors spending the night at the house on Second Street. 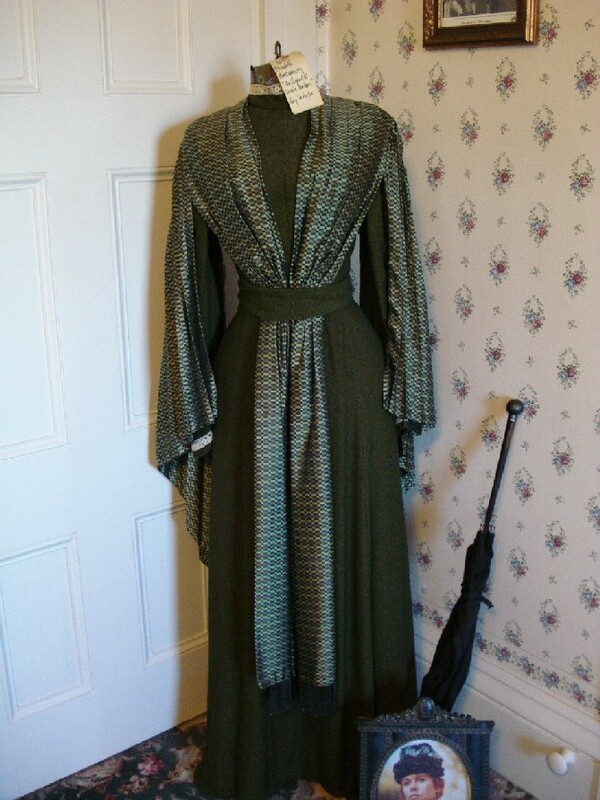 Miss Montgomery was a size 4 when she wore this dress, which is actually a gray nubby-textured wool blend with a caplet with accordian-pleated long lappets which hang down the front and tuck into a belt at the waist. The very full accordian-pleated wide sleeves give the impression of the popular leg o’ mutton sleeve which was growing ever-larger in 1892. 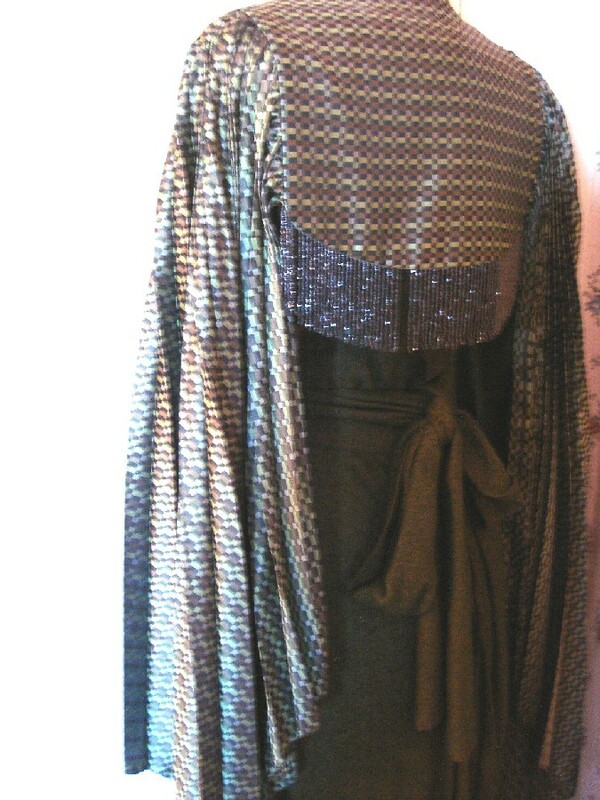 The back of the cape is finished off with heavy metallic bead fringe. Sadly, guests at the house have purloined some of these fringes as souvenirs (see photo). 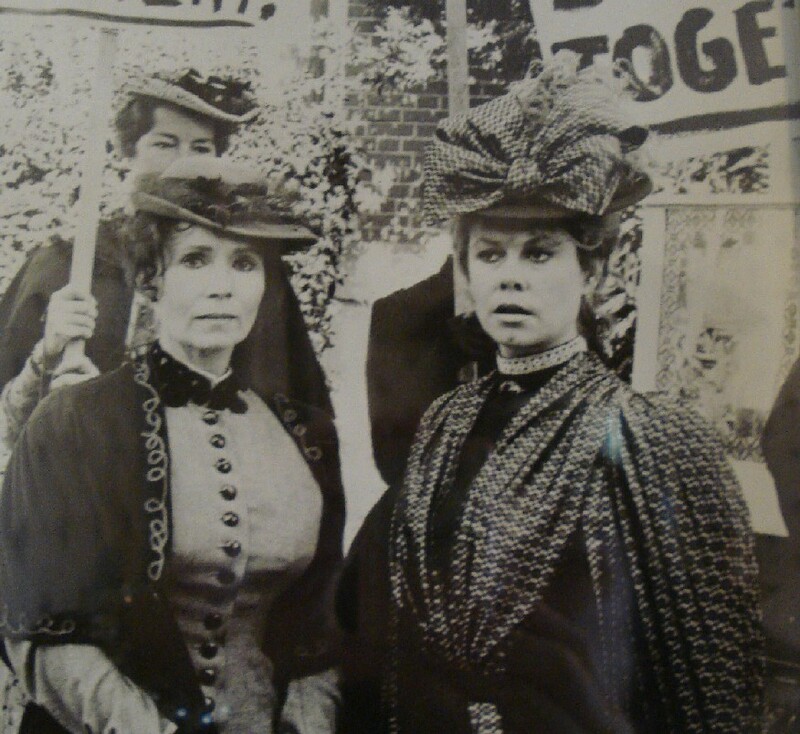 The late Guy Verhille, veteran costumer of many large screen and television productions won an Emmy, as did the set designer, in 1975 for his work in The Legend of Lizzie Borden. The hat to this ensemble was unfortunately thrown away. 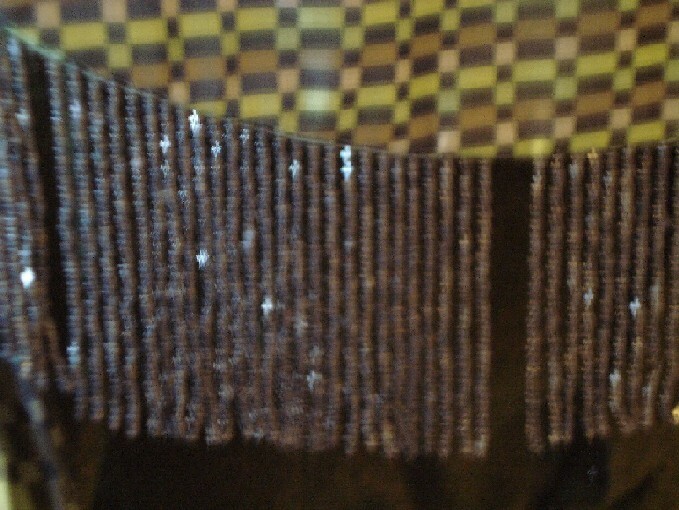 It featured a strong vertical embellishment as seen in the photo below, which was exactly correct for the era.